The Rio-X is the high tech version of the Rio. Featuring the same shape as the Rio, the Rio-X is dressed in our Gatorskin™ giving it a stronger, lighter and more lively feel compared to the Rio. 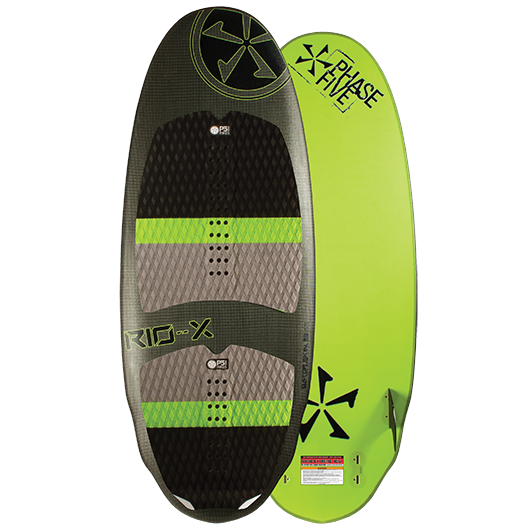 Equipped with the P5 quad set up, this board will cruise down the line or bust airs on command. If what you are after is the best in materials and performance, the Rio-X is the option for you. 50	50″ × 19.75″	1.75″	5’4″ – 6’2″	190 Lbs. 54	54″ × 20.5″	1.8″	5’7″ – 6’4″	220 Lbs. 58	58″ × 20.75″	1.9″	5’8″ – 6’5″	250 Lbs.